When broken, the annealed laminations will fracture but remain bonded to the interlayer. This behaviour realises improvements in safety and security. 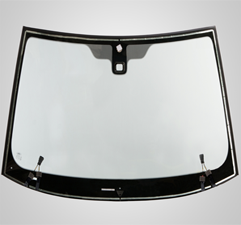 Front windscreen for automobiles are generally made of laminated safety glass, a type of treated glass, which consists of two (typically) curved sheets of glass with a PVB (Polyvinyl Butytal) laminated between them for safety, and are bonded into the window frame. In the case of breakage, the glass is held in place by the interlayer PVB, retaining emergency visibility for the driver. Laminated glazing is now also increasingly being specified for car side windows. Usually the glass plies are shaped (curved) as matched pairs through heating to a temperature of around 620°C. As with tempering, the shape can be achieved through gravity 'sagging' or through press-bending for the more complex shapes. Differential heating to control temperature across the surface of the glass, and hence the resultant degree of bending, is also used for more complex shapes. The shaped glass pairs are then gradually cooled to room temperature before the PVB laminate is sandwiched between them. At this point the PVB is opaque and only becomes transparent at completion of the lamination process. This involves the removal of any air trapped in the glass sandwich through a mechanical or vacuum squeezing process, followed by the heating of the windscreen to 140°C within an autoclave, under a pressure of 10 to 15 kg/cm2, to complete the bonding of the two glass plies. 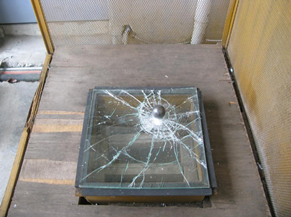 Since the PVB films adhere tenaciously to the out-layer glasses, it can resist the penetration during accidental crash as the car is traveling at a high speed. 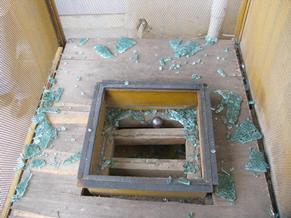 When the glass gets broken by impact force, the broken pieces will be stuck by the tough PVB film, which can prevent the broken pieces from flying and falling. The whole glass will be kept perfectly. 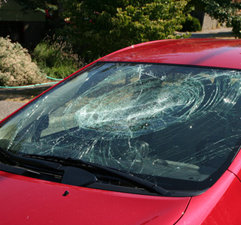 Therefore, personal injury caused by flying of falling broken pieces can be avoided while the cars can keep running. In this case, traffic accidents can be avoided and personal safety is effectively ensured. Laminated glass for automobile has the capability of lasting resistance to ultraviolet radiation. 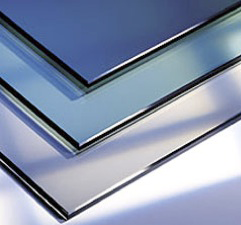 The 6mm float glass can resist ultraviolet with the wavelength of shorten than 380mm. It can resist 29% of ultraviolet rays. However, clear laminated glass for automobiles with the same thickness can resist more than 90% of ultraviolet rays. Thus, it protects decoration in the car from fading and aging caused by ultraviolet radiation. We can make laminated windscreen to your specification. *** Invisible Compliance Mark for vintage/collectable cars.